I’m super excited that this piece is currently on exhibition at San Jose Museum of Quilts & Textiles as part of Excellence In Fibers 2017. 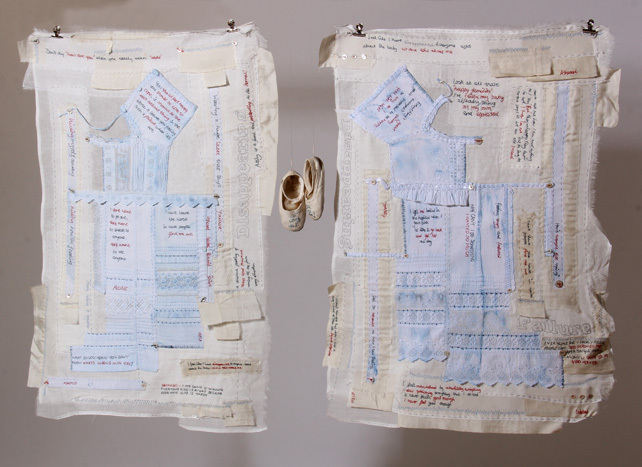 This is an annual juried textile exhibition by the magazine Fiber Art Now highlighting innovative and contemporary textile art. I was absolutely thrilled to have my work selected as one of 44 pieces from the 1949 submissions to be not only published in the magazine but also exhibited at the museum. I’m even more delighted that SJMQT are using my image on their website to promote the exhibition. It will be showing until Jan 13th 2019. 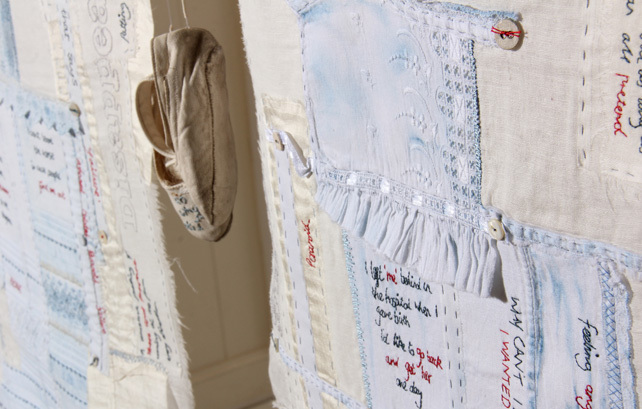 HiStories Uncovered is an installation piece consisting of three textile panels and a pair of vintage baby shoes. The original inspiration came quite by chance while half listening to the radio. I have absolutely no idea what the programme was or what it was about but something sparked my interest at the time and I wrote down the phrase ‘Locard’s Exchange Principle’ in my notebook. I came across it again some time later and looked it up. Locard’s exchange principle is a concept that was developed by Dr. Edmond Locard (1877-1966). Locard speculated that every time you make contact with another person, place, or thing, it results in an exchange of physical materials. He believed that no matter where a criminal goes or what a criminal does, by coming into contact with things, a criminal can leave all sorts of evidence, including DNA, fingerprints, footprints, hair, skin cells, blood, bodily fluids, pieces of clothing, fibers and more. At the same time, they will also take something away from the scene with them. This kind of fascinated me and really got me thinking. If we accept that we leave physical traces with someone that we come in contact with then, of course, we also leave emotional traces. After all we talk about someone ‘touching’ us (as if it were a physical thing) when we are left with a strong feeling or memory of them. I went on to consider that if the emotional trace was actually physical, what mark or evidence would it leave. 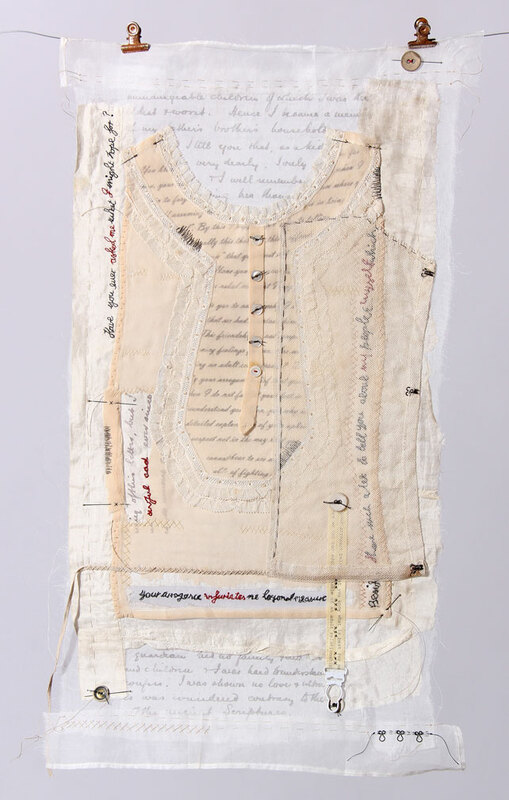 I decided to follow this Thread of Thought further and see where it would take me and this was really the start of my fascination by the thought that an old piece of clothing is implanted with stories of the wearer. Are you with me so far? 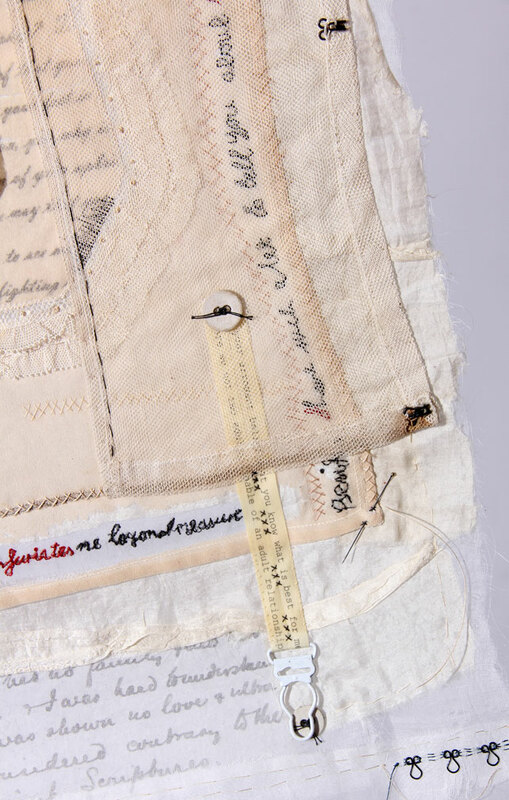 I decided to work with old garments and quite literally take them apart piece by piece to reveal this imagined emotional evidence left behind by some person who had touched the wearer in some way. 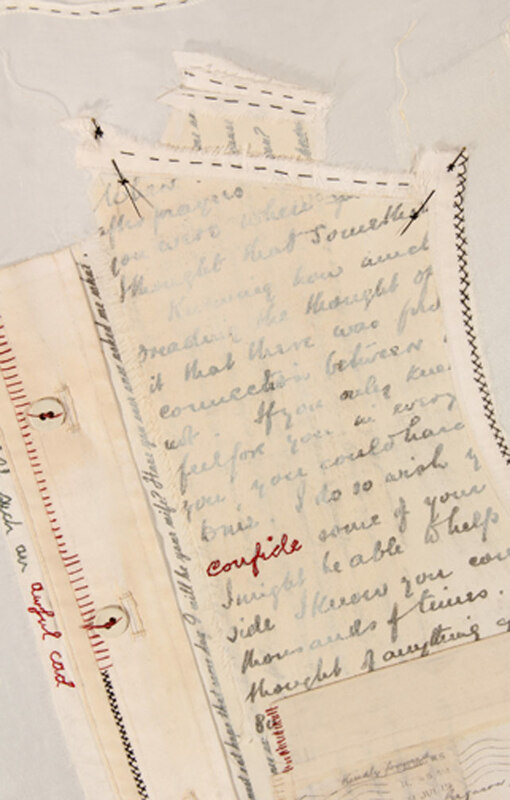 I collected my evidence from text taken from my collections of old letters and used old and worn garments from my stash. The letters and garments were not actually connected in any way apart from in my imagination. I wanted the pieces to be rather ethereal so I chose to work with beautiful old and very delicate silks and organzas as my background fabric. Again all old and used and bringing their own hidden stories to the piece. Please don’t misunderstand the meaning of this letter but I have felt such an awful cad ever since the occasion I was so unwise as to feel very sentimental, that I owe you a few words of explanation, which will probably read better as distance separates us. Can I begin better than by asking you to forgive me? It may seem hard for you to do so but all the excuse I can offer is that I love you. To you that really ought to be mitigating circumstances. Thinking over everything, I can’t really find sufficient reason on your side to say that I must not hope that some day you will become my wife. David Copperfield could hardly ever have felt worse than I.
I love the fact that I only have two letters and can’t pry any further. There is enough information in the letter to find a lot more out about dear Gillie but I’ve never been tempted – I love a little glimpse into a life but don’t wish any more than that. I used the writing from the letters and tried to be true to Gillie’s handwriting with my own stitching. 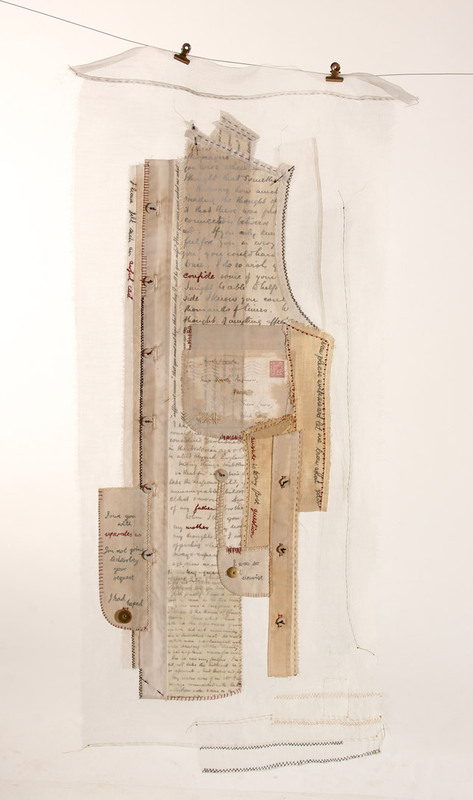 This piece was stitched onto a background of beautiful old silk organza. 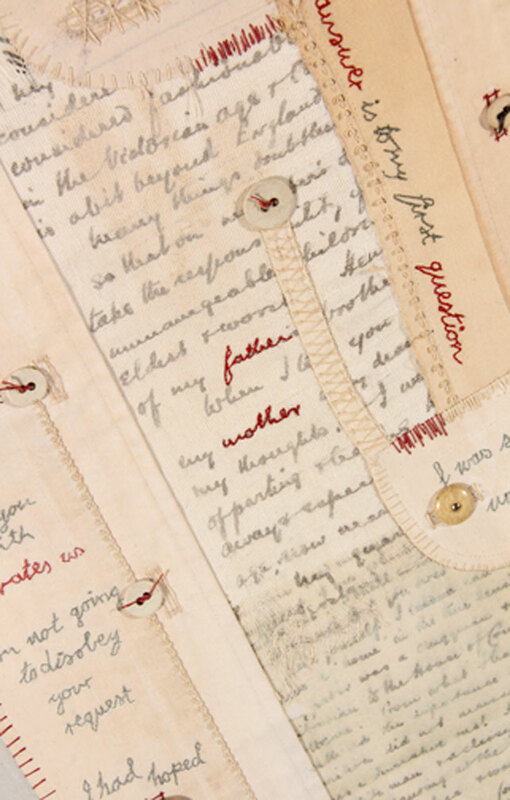 Pinned in places, words and phrases highlighted by stitching and offering the tiniest glimpse into Gillies emotions towards this women who had touched him and won over his heart at this time. Well it had to be done didn’t it? I had to let Miss Dorothy respond to Gillies letters and capture some of her spirit in doing so. I don’t have any letters from Dorothy so I have no idea of her actual response or how the story turned out. Did they indeed marry or did Gillie offer his excuses and leave the school as he said he would if she asked? I’ve no way of knowing. I very seldom completely make up a story, that’s something that usually holds no appeal to me. However something about Gillie & Dorothy had me captivated and I found myself feeling (justly or unjustly?) rather indignant on Dorothy’s part. I think it was his assumption that what she really needed to change her mind was to hear more about him that got me riled. He definitely hadn’t read ‘Men Are From Mars, Women Are From Venus‘! You bloody, bloody man. While I confess to a fondness for you, your arrogance infuriates me beyond measure. Just when I begin to forgive your presumptions you follow on from where you left off assuming that your only misdemeanour is in being ‘sentimental’. You cannot see ‘sufficient reason’ that you must not hope that some day I will be your wife? Have you ever once asked me what I would like? Have you ever once asked me what I might hope for? This friendship is not compromised by your confession of having feelings for me. Are we not two adults capable of having an adult relationship? This friendship is compromised by your arrogant belief that you know what is best for me and when I do not fall at your feet in compliance it is because I misunderstood you. You, you why is it always about you? Your detailed explanation of your upbringing provides the answer but I suspect not in the way that you were intending. And it goes on further in that manner and gives poor Gillie quite a rollicking. I can only think that at the time of writing I was having a bad day! I do love the thought that the words of a complete stranger inspired such indignation in me. Anyway more about the piece itself. 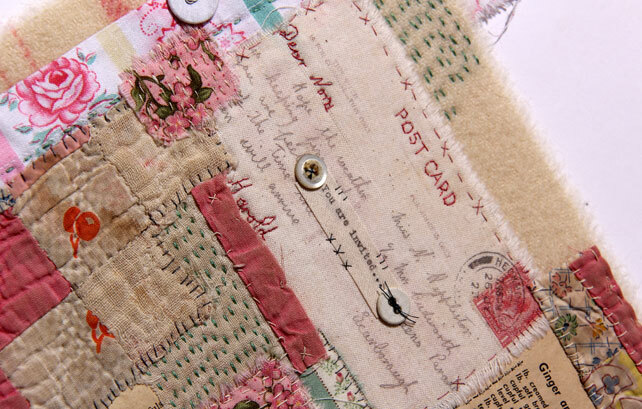 I used a beautiful antique modesty panel and applied the words of my letter to it. 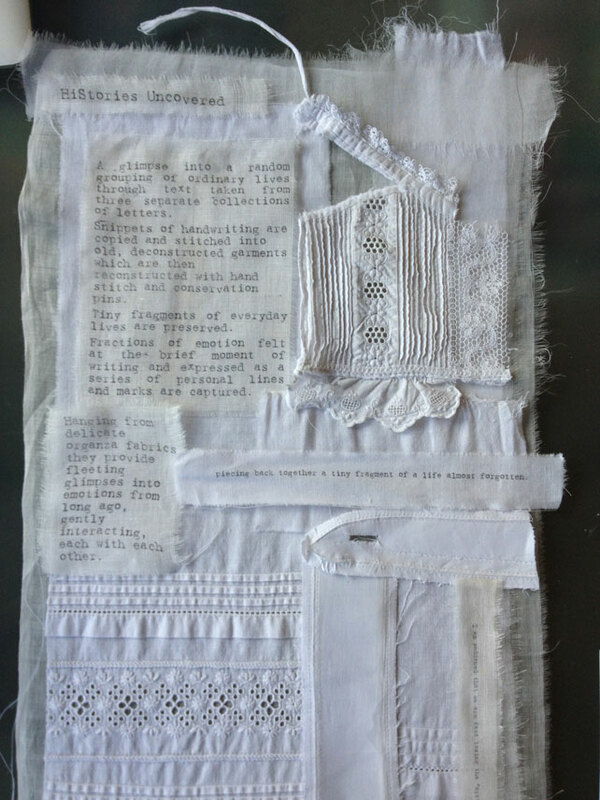 It is made of the most fragile silk which disintegrated in parts as I was stitching. This was layered onto a background of old silk that came from a dress lining. This came from a friend’s mother’s house and had clearly been cut off when a dress was shortened from long to short. 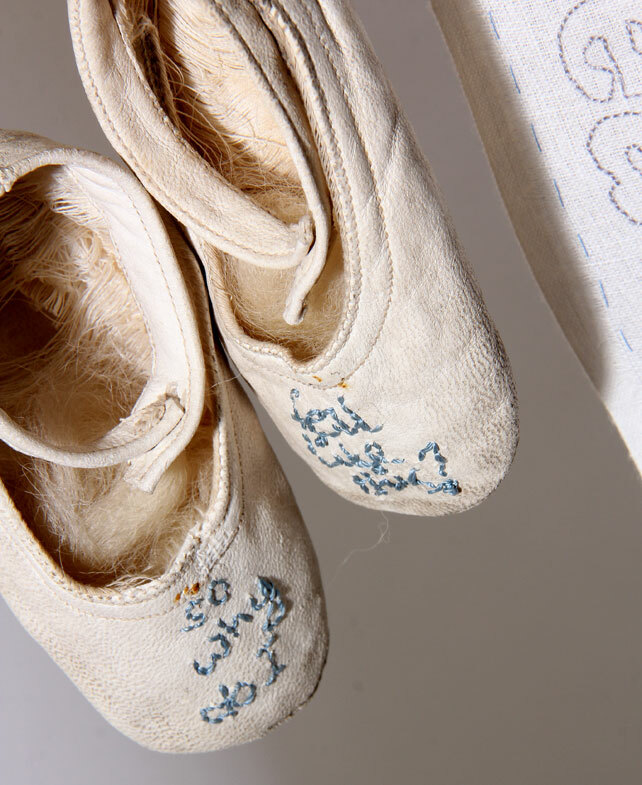 Marked and worn with lovely stitched seams, it became a prized piece of fabric waiting for just the right project. I was a bit devastated when I used the last pieces up in my Not Just Blue quilts. 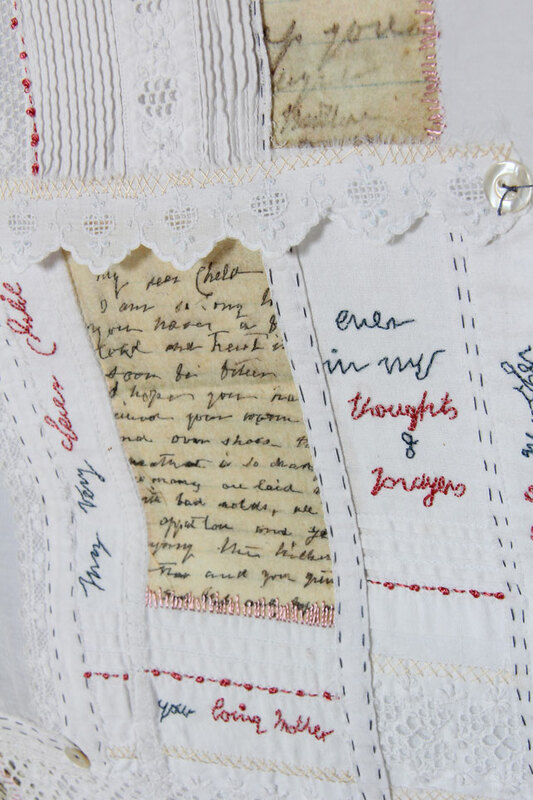 Layered over the modesty panel was another very fine antique dress panel and again I layered fabrics and highlighted words in hand stitching. 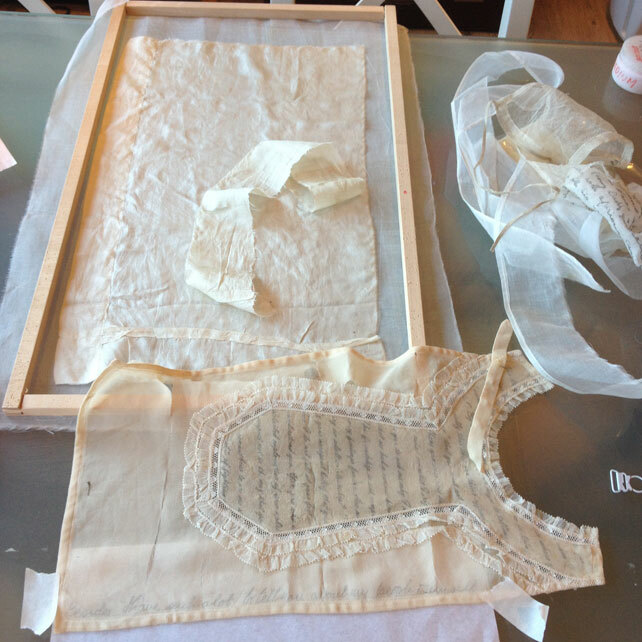 I stretched this piece on a frame to stitch, because it was so delicate and in danger of disintegrating completely. I don’t usually stitch with a frame although perhaps I should. I tend to suit my way of working to whatever materials I am using at the time. 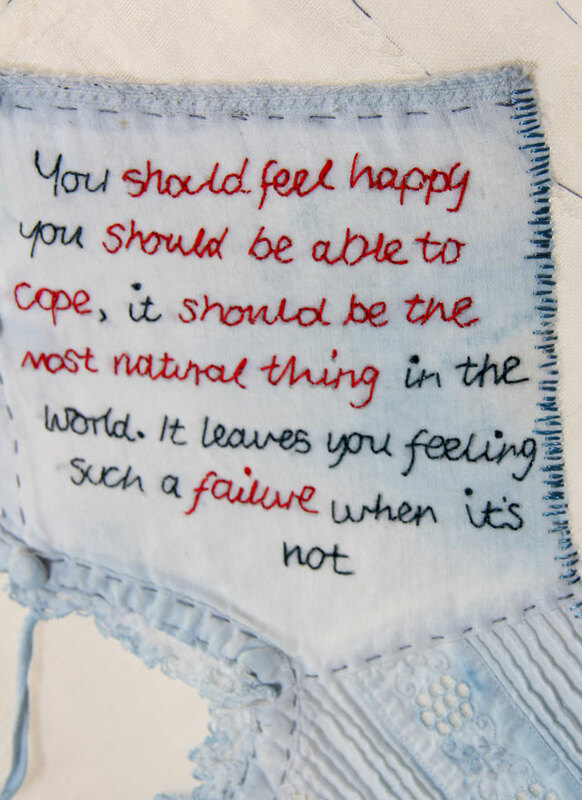 In honesty I make things up and experiment as I go along rather than doing extensive sampling beforehand and I’m afraid with no formal training in embroidery I am completely unaware of the right way to do things – and I rather like this. I’ll be teaching some of my techniques that I used in these pieces at my 5 day workshop next year with Fibre Arts Australia and Fibre Arts New Zealand and who knows maybe sometime in the UK if I’m invited to do a summer school or winter school sometime. Big hint!! God bless and keep you, I am sending you some of the leaves out of my prayer book which I trust will comfort and help you. It tells of the loving kindness of our Heavenly father in all that concerns sand his watchful care over us. 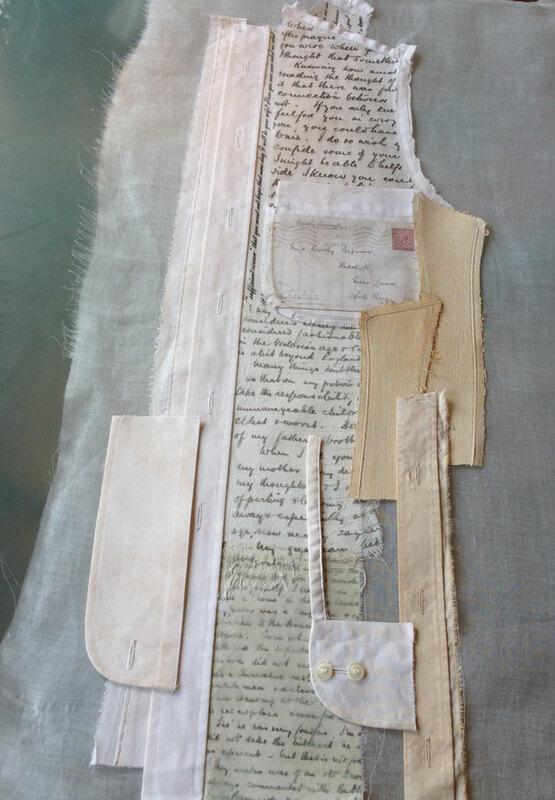 I feel rather humbled to have such poignant correspondence in my possession but rather love the act of preserving this emotion in stitch and bringing it back to life. It saddens me in a way that letters like these have found their way onto Ebay because somewhere along the line they have been discarded as of no interest. 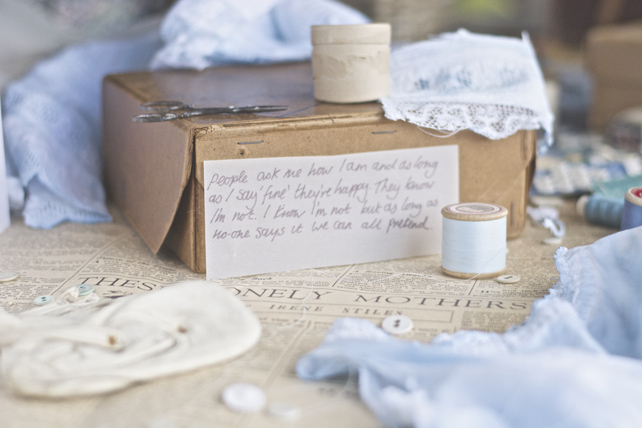 But I have no way of knowing the back stories and I’m a more than willing recipient of these little treasures and it breaks my heart to think that they could’ve ended up in landfill – or recycling – but there’s a thought that could take on a whole new direction!! Again it is stitched on a background of the old silk organza. 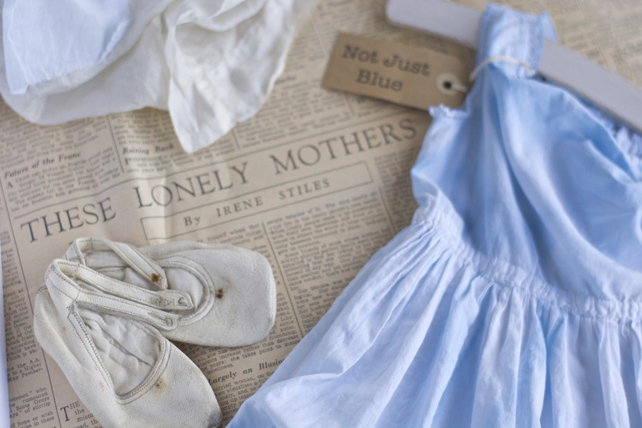 I have deconstructed a beautiful hand stitched antique baby gown, possibly a christening gown, and added the most tiny mother of pearl buttons. This piece became the inspiration for my Not Just Blue quilts. 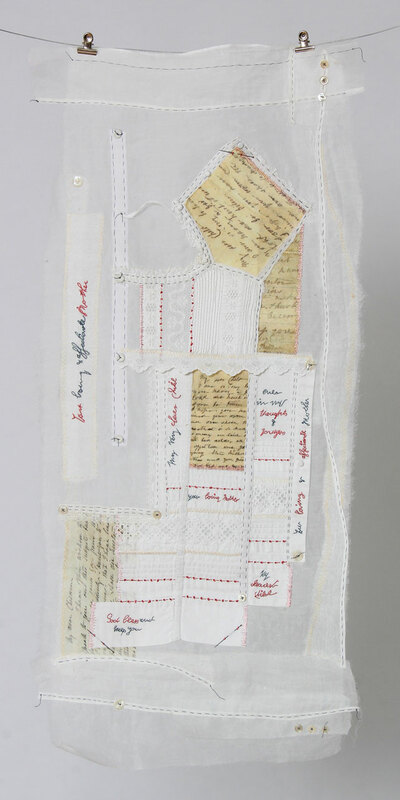 There was something very poignant about taking apart and then re-piecing together these beautiful little dresses. 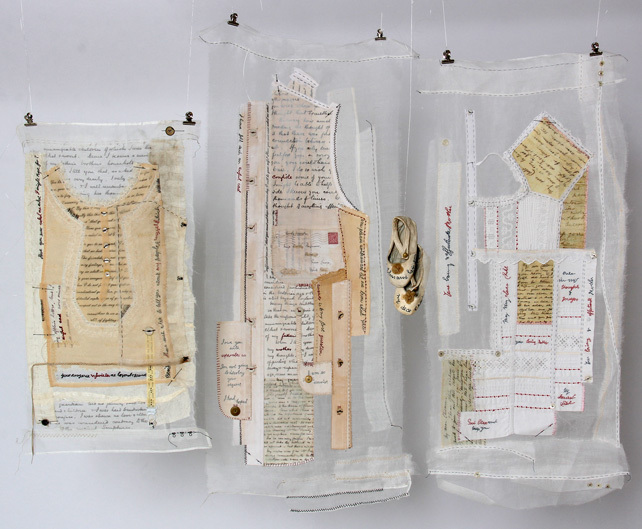 I am continually inspired by the shapes of garments pieces and find the act of re-arranging and placing each part to be so very engrossing and pleasing. I don’t think I’ll ever tire of it. 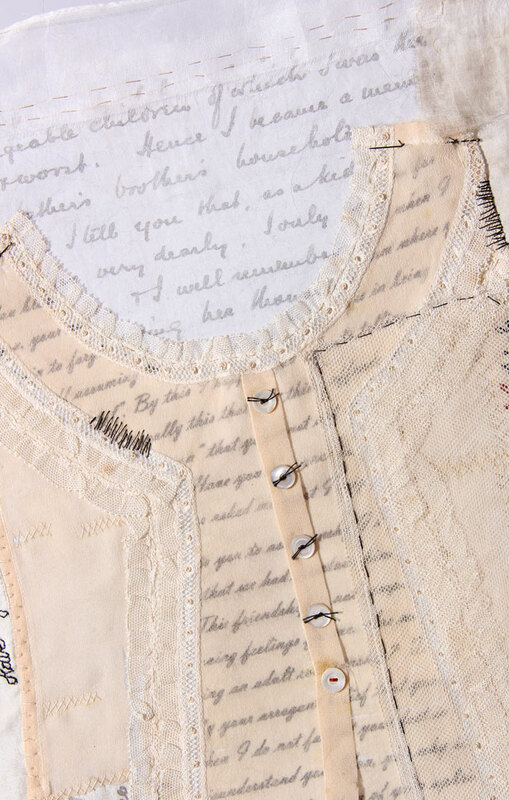 As well as the stories and energies of those who wrote the letters and the recipients of the letters these pieces are also imbued with the stories of the garments themselves and the real wearers. I love how all these energies entangle and interact and therefore become one with each other. I rather imagine this to be much like how the energies of any group of strangers finding themselves randomly in each others company will intermingle and interact with each other – often completely unnoticed but a connection has been made. In my mind this rather neatly takes us back to Locard’s principle of exchange where every time you make contact with another person, place, or thing, it results in an exchange of physical materials. I rather like to think that there is also a very real exchange of emotional energies and I rather think that this thought will keep me inspired for a long time to come. 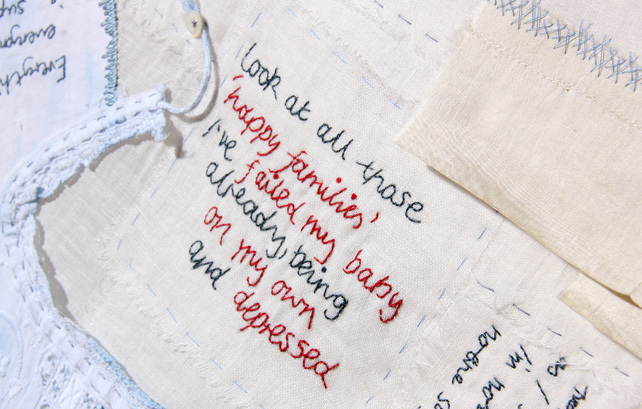 And lastly – sometimes I like to stitch little pieces in explanation – a bit like a rather gorgeous sketchbook page.